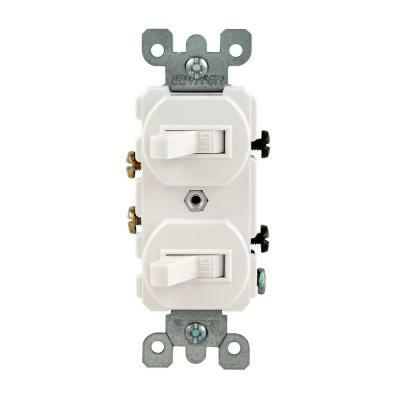 While most light switches have screw terminals on each side, there are some that have plug-in connectors. Our experts suggest sticking to the switches with screw terminals, as they’re more reliable. 1. Before starting your project, turn off the power to your light switch in your circuit breaker box. To make sure the power is completely off, use your voltage tester to make sure there’s no electrical current present. 2. Next, use a screwdriver to remove the screws on the old light switch cover. 3. Then, remove the screws that secure the switch to the electrical box in the wall. 4. Pull the switch out of the box and examine how it is wired. If possible, take a quick picture so that when you install the new switch, you wire it correctly. 5. Unscrew the switch’s side screws and remove the old wires using needle-nose pliers. Then, remove the switch. 6. Make sure your new switch is oriented correctly by locating the word “top” printed on it and keeping that end toward the top. 7. After that, you can reconnect the wires to the new switch by wrapping the wire around each screw and then tightening the screw down. Just make sure you reconnect them the same way they were connected to the old switch. Refer to your photo if you need to. 8. Carefully push your new switch back into the electrical box and reattach it using screws. 9. Reinstall the light switch cover and then turn the power back on to your light switch. Test the switch a few times by turning it on and off to make sure it works correctly.